PDF's and JPEGS can be uploaded as they are. All other file types listed below, will need to be placed inside a zip folder for uploading. If your file type is not listed below please contact us. RGB files will be converted to CMYK this will affect colour. Due to the tight production schedules we don't print Pantone or spot colours. All files must be CMYK. TIFF: (image) Reduce to single layer. Microsoft Word: Please also upload a PDF made from the word document. Please note the maximum file size that can be uploaded is 125mb. PDF's and JPEGs can be uploaded to our server as they are, all other file types will need to be put into a zipped folder for uploading. If you have larger files to upload please use a free service like Dropbox. If you have more than one file to upload multiple file uploads are allowed. If you are unsure how your artwork will print, please take advantage of our free artwork checking service by choosing on screen PDF proof in the ordering process, our graphics team once your order has been processed, will then check your artwork and will notify you if any problems are detected with resolution, bleeds and sizes. We will endeavour to check your artwork within a few business hours, but occasionally due to busy workloads this could take longer. Also please specify what finished size you are looking to print. Please leave 5mm inside of the finished edge, no text or important information should be placed here, as it runs the risk of being trimmed off in the finishing process. 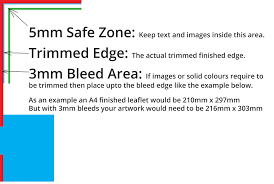 We also need a 3mm bleed, for example if you have a finished product that's A4 210mm x 297mm your artwork needs to be 216mm x 303mm which gives a 3mm bleed round every edge. A common problem we come across is that we are asked my artwork looks great on screen, so it should be OK for print. Technically a screen will display a document at 72dpi (dpi stands for dots/pixels per square inch) but when printed you will see 300dpi. A good way of checking your artwork to see if it's OK for print, would be to enlarge the document by at least 400%. If you get any pixelation or distortion then your artwork would be classed as low resolution and the print quality would suffer, if however the artwork has no pixelation or distortion, then as a general rule you should be good for print.